As successful as Studio Ghibli has been over the years, it hasn’t gone for the easy money of feature length sequels. That’s a pretty had temptation to avoid. Think of all the money studios have made in the last few decades by cranking out new installments of their blockbuster animation hits. Think anyone at the studio stood up and said, “Let’s not make Shrek 2, Despicable Me 3 or Cars 3! Let’s not ruin the joy of the originals!” Because no studio executive would allowed to stay on the lot until lunch with that attitude. Even Disney cranked out a bunch of sub-par sequels to their masterpieces with straight to VHS cash grabs. But there’s no My Neighbor Tortoro 2: Furry Boogaloo or Spirited Away Again as Studio Ghibli as avoided the temptation. That’s not to say that in their history they’ve never looked back, but they were extremely original in a second visit with a familiar face. 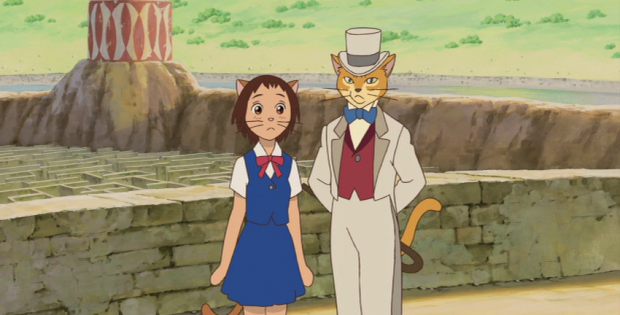 The Cat Returns brings back Baron, a cat that wore a suit and top hat in Whisper of the Heart. He was a statue that transformed into a minor character in small fantasy sequences. He had a big enough impact on viewers that Studio Ghibli made him a star. The Baron wasn’t supposed be starring in a feature length film. The original plans was a theme park wanted to commission a 20 minute short film from Studio Ghibli to run exclusively on site. Their only request is that it featured cats. Hayao Miyazaki took on the original project with the dictate that the film will feature Baron. While in production, the theme park deal fell apart. Miyazaki used the “cat project” to test potential directors. When he gave it to Hiroyuki Morita, the animator who had just worked on My Neighbors the Yamadas went beyond the short film exercise. He turned in storyboards for a feature film. And Miyazaki gave him a green light to make it happen. The Cat Returns has nothing to with the human characters in Whisper of the Heart. There’s a new girl at the center. Haru (Anne Hathaway) is a shy student who has the remarkable ability to talk to cats. One day she rescues a blue cat from what could have been a horrible accident. Her alert behavior gets her an immediate reward from The Cat King (Rocky Horror Picture Show‘s Tim Curry). She is showered with catnip and mice since it turned out the blue cat was a prince. Even bigger is the offer of getting to marry the prince. She’s stunned by the offer which gets misinterpreted as a Yes. She has to seek out the help of the Baron (Princess Bride‘s Cary Elwes). But the Cat King wants his daughter-in-law. When she protests that humans can’t marry cats, she finds herself looking more and more feline. She just wants to get back to high school. The Cat Returns makes great use of bringing back Baron. He’s a smooth and slick as his first go around. This is not merely a chance for Studio Ghibli to market a new round of toys. He’s a lucky cat that inspired a short flick into a feature role. The video is 1.85:1 anamorphic. The 1080p transfer brings out the details in the marvelous fantasy world. The audio is DTS-HD Master Audio 5.1 for both the English and Japanese dubs. The English version sounds more full. The French track is 5.1 Dolby Digital. The subtitles are in English, Japanese and French. Feature Length Storyboards with the finished audio. The Making of the Cat Returns (33:58) gets inside the production included tales of the theme park beginning. Behind the Microphone (9:03) shows off the all star voicing cast that also included Peter Boyle (The Friends of Eddie Coyle0, Elliott Gould, Judy Greer, Andy Richter (Conan) and Kristen Bell (Frozen). Trailers (6:37) sells the Kingdom of Cats. DVD with everything on the Blu-ray except storyboards. Shout! Factory & GKIDS present The Cat Returns. Directed by: Hiroyuki Morita. Screenplay by: Reiko Yoshida. Starring: Anne Hathaway, Cary Elwes, Peter Boyle, Elliott Gould, Tim Curry, Judy Greer, Andy Richter and Kristen Bell. Rated: G. Running Time: 75 minutes. Released: January 16, 2018.